Another excellent tie-in from the main 'Secret Invasion' title. Like in last weeks 'Mighty Avengers', actual superheroes in the Avengers are very much peripheral figures. In fact, in this issue, humans are conspicuous by their absence. This does not make a jot of difference, as the story is immersive and provides more valuable references to the overall 'Secret Invasion' story. Bendis goes back through Marvel continuity and lets the Skrulls take centre stage as they map out their invasion plan, explaining along the way how long established characters in the Marvel Universe could have feasibly been Skrulls all along. 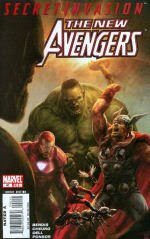 Its a fluid, consistent piece of work, with a nice twist at the end as another Skrull imposter is revealed to us. How this revelation will play out in the overall 'Secret Invasion' arc remains to be seen, but it leaves this issue on a high point. Jimmy Cheungs art breathes life into the Skrulls, especially the really mean looking ones. They look like a threat, physically imposing. Cheungs art is clean and bright and makes the Skrull Universe come alive. There is also a great splash page with Galactus in it, depicting the devouring of the Skrull homeworld. These tie-in issues have, so far, really added to the main title, which is promising, as the next few months see more and more titles pulled in to expand the story of 'Secret Invasion'. I hope they maintain the high standard set by the 2 recent Avengers titles. Verdict - A strong back story that adds to the main 'Secret Invasion' title. Some important plot details are revealed, and we discover another of the Skrull imposters. Great art throughout the issue. 8 out of 10.